Despite being Italian, both eaters are paridoxically not much into going out for pizza. Maybe this is because so much of it is mediocre? But when we do go for pizza, we either do Neapolitan-style of Chicago-style deep-dish (Yes, Chicago-style IS pizza). So when we heard about Vero Pizza Napoletana (12421 Cedar Rd, Cleveland Heights, OH) and the accolades heaped on it and its owner Marc-Aurele Buholzer we were cautiously excited. The focus here is on Neapolitan pizzas cooked in authentic 900° wood-fire oven (inside which a pizza is cooked in only 90 seconds). Vero’s interior is sleek and simple, and has two stories – but even so, it is not a huge place. Another feature of the second floor is that you can look right into the kitchen and see the oven and pizzaiolo at work, which is pretty cool. The only thing on Vero’s menu is basically pizza (10″ pizzas that serve one, with a little to spare), which we always appreciate in a pizza place. The varieties available at Vero run the gamut from classic to creative ad include pizzas with and without red sauce – the Blanca features mozzarella, basil and garlic (and no red sauce). The inventive Milk ‘n’ Honey is topped with a farm egg (which you can also add to other pizzas for $2) and wild honey. For those feeling peckish, you can get a local cheese platter, olives or charcuterie to start off your meal. First, we selected one of our favorite pizzas, the stalwart Margherita – tomato, basil and fresh mozzarella – the classic by which we judge almost any pizzeria. Next, we opted for the “Capua” variety which was topped with prosciutto, arugula and Parmesan cheese. The pizzas arrived quickly, as advertised. The pies initially come out uncut and the server will cut them for you into whatever configuration you may wish. The traditional way to eat this kind of pizza is by knife and fork anyway. Overall, the topping were fresh, generous and uniformly excellent, and the sauce was the perfect consistency. The crust was a little thicker than Neapolitan pies might be, but we don’t have any complaints. The hype behind Vero’s fresh and authentic pizzas turned out to be warranted, as evidenced by the fact that we practically inhaled our pizzas. We also appreciated Vero’s commitment to the art of Neapolitan pizza. For example, in addition to the authentic oven of course, Vero doesn’t deliver pizzas and instead focuses on having the in-person Neapolitan experience. This makes perfect sense, since this kind of pizza really doesn’t taste the same unless you are eating it fresh out of the oven. We would definitely go back for another pizza fix soon, especially since we are so far from our deep-dish alternatives. As if that wasn’t enough, the gelato in the front counter looked pretty good, too. Let’s be frank: we are total pizza snobs. When it comes to pizza, it takes a lot to impress us. 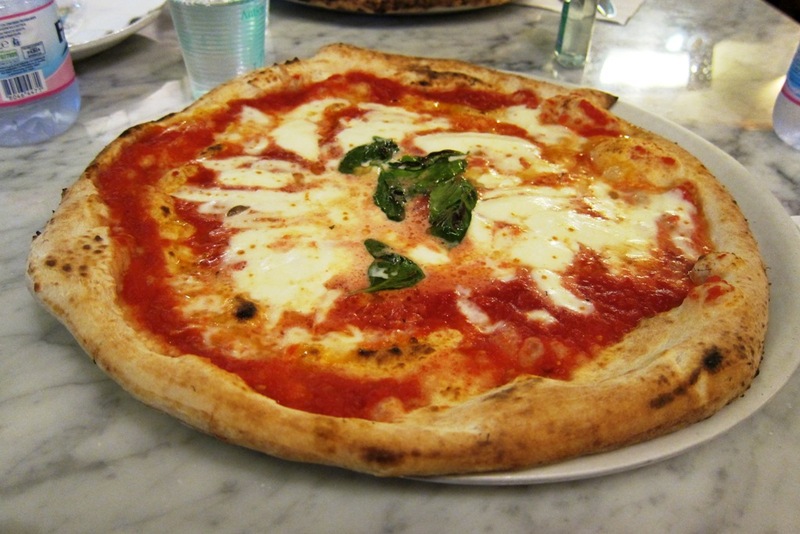 Maybe it is because we had superlative pizza in Naples, and let’s be honest, there is nothing like pizza in Naples. Maybe it is because both of us come from Italian families. Or maybe (and this is probably the most important) it is because Matt’s grandmother has owned and operated her own pizza shop for the last fifty years. In any case, we were surprised to fall so quickly in love with Pummarola, a small restaurant serving up pizza that part Neapolitan, part northern Italian, and part pure Miami. Small with not even ten tables, the tiny space is dominated by a stone pizza oven and a red Fiat 500 car stuck into the wall as decoration. Love it. Maybe an allusion to the Neapolitan traffic? Pummarola’s menu includes pasta and salads, but the main attraction is the pizza, which is made exactly like we had it in Naples – and thus exactly as we have come to expect it. The obvious reason for this? Everyone who works at Pummarola, from the owner to the pizzaolo, is Neapolitan. Everyone except the ebullient and witty manager, who hails from northern Italy: “I’m the only real Italian here!” he quipped with a wink, echoing the north / south Italian cultural divide. With a Neapolitan pizzaolo behind the counter, it is no surprise that we found the pizza to be purely Neapolitan. It was fun to watch the pizza being prepared and the white tiled pizza oven heating up. We went twice, and each time split a large pizza (which is really is enough for 3). The first was a perfectly-made margherita, with buffalo mozzarella and perfect tomato sauce. Other varieties included spicy salami, truffled mushrooms and pancetta. On our second trip we had a prosciutto and arugula pizza, also fantastic. L, always one to explore further afield, tried the arancini, which was good, but nothing to write home about. Our quest for a respectable arancine in the US continues. Still, that pizza just blew us away. This was one of the best pizzas we’ve had in this country (not on this side of the Atlantic, though – we’re looking at you, São Paulo) and one of the few that approximated those we had in Naples. We liked both pizzas, but our hat tip goes to the margherita, for its clean flavors. 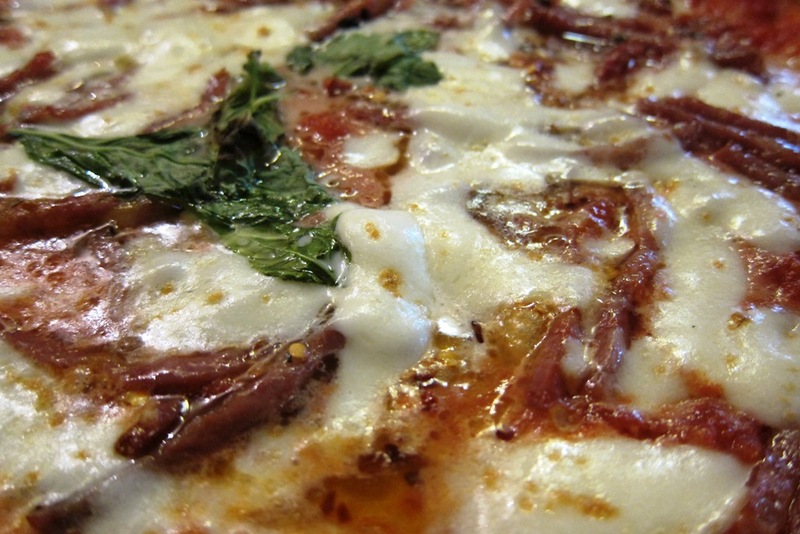 If you are craving Neapolitan style pizza, do not think twice to head Pummarola. It is cheaper than a flight to Naples! We’re pretty picky about our pizza, and pretty sure that going to Naples has made us even pickier about Neapolitan style pizza in particular. However, when the pizza craving hits, it hits hard. And fortunately there are some truly great places to get Neapolitan pizzas in Chicago. Spacca Napoli is one of those places. When we learned that one of the owners had trained to be a pizzamaker in Naples and had an Italian brick oven, we were definitely sold. Spacca Napoli has a nice selection of pizzas, divided into “Rosse” (with red sauce) and “Bianche” (without) including the two essential Neapolitan styles, Marinara and Margherita. At $9.50 and $12.50 respectively, the pizzas were more expensive than in Naples, but still very reasonable. We selected two pizza on our visit, a red pizza and white pizza, without the typical marinara sauce. The white pizza, Bianco Nero ($16.00) had Pecorino cheese with black truffles, Fior di Latte mozzarella, porcini mushrooms, and finished with white truffle oil. M ordered his favorite combination from Napoli, the Diavola ($16.00) which was topped with mozzarella di bufala, spicy salami, red pepper flakes and basil. The crust of the pizza was excellent: both chewy and light, and not soggy at all in the middle (our pet peeve). We also appreciated the generous hand with the toppings, and the availability of buffalo mozzarella. The pizza was great, but don’t let that be the end of your meal. Spacca Napoli also has gelato ($4.50) in a variety of flavors: cream, hazelnut, cappuccino, chocolate, pistachio and raspberry. We ordered a scoop of chocolate, even though we had polished off both of our pizzas. We highly enjoyed our pizzas at Spacca Napoli – we think we have found our go-to Neapolitan pizza place in Chicago. 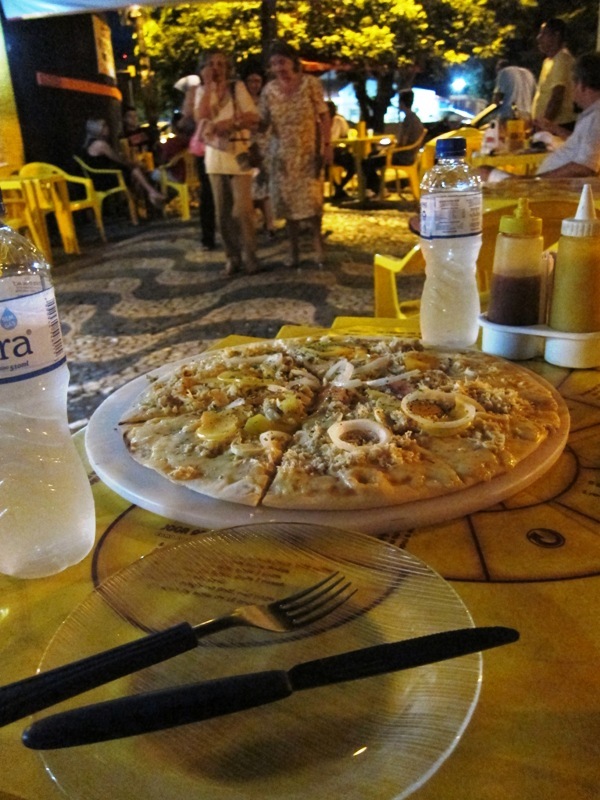 So of course, after singing the praises of Mineira cuisine, the first food post of our food adventures in Minas Gerais is the decidedly non-Mineiro pizza! But no worries, even though pizza is an import to Brazil, Brazilians have latched onto it – and O Passo does an excellent rendition of pizza. We decided we needed more of a leisurely meal after walking down the grueling hills of Ouro Preto, and O Passo was consistently referenced as one of the best restaurants in Ouro Preto. The stock in trade at O Passo is pizza – though there are a variety of other Italian specialties – including a large assortment of antipasti, pastas and Italian wines. The setting of O Passo is great – with a nice little terrace overlooking the botanic gardens (which are unfortunately closed). The pizzas come in 3 sizes – Individual, Medium and Large. The individual is roughly plate-sized and had 4 slices. Each was more than big enough for each of us (R$ 28 per individual pizza). There were 4 full pages of pizza flavors ranging from classic Italian combinations as Margherita and Quattro Formaggi as well as Brazilian flavors like Minas cheese and Frango & Catupiry. M selected a (slightly) healthier riff on the quattro formaggi – the quattro tomate – which came topped with mozzarella, sundried tomatoes, tomato sauce, heirloom tomatoes and roma tomatoes. All the toppings were fresh; with the heirloom tomatoes still sweet and the sundried ones with a great flavor. L picked a cheesier variety with a Mineiro touch: Minas cheese and Buffalo Mozzarella with roasted garlic and fresh basil. Before too long, our pizzas arrived piping hot to our tables. They had more of a cracker-style crust unlike the Neapolitan style of pizza with a more leavened and bubbly dough. We were big fans of these pizzas – especially the crunchy crusts and generous toppings. All told, about US$30 for two excellent pizzas in a beautiful terrace in this great colonial town? It wasn’t Mineira cuisine, but it is all the more reason to visit Ouro Preto. We had a great time at I Decamuni, but our pizza quest could not stop there. 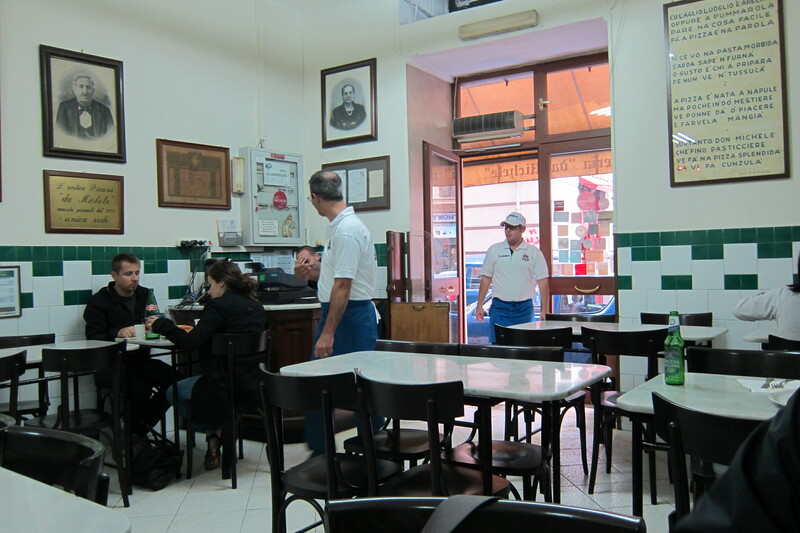 We pushed forward to what we heard was the best (and busiest) pizzeria in Naples, Da Michele. It is also one of the most famous owing to a certain recent Hollywood movie appearance (we won’t mention which one) and simple word of mouth over the years since its opening in 1870. We heard that there would be lines snaking in front of Da Michele long before the 11 AM opening times, and that we should be prepared for hordes and hours of waiting. Steeled for a potentially harrowing experience, we arrived at Da Michele at 11 AM on a Monday, surprised to find only ONE other table filled. By the time we left, there were still a few tables open, and no line. So take the warnings with a grain of salt (at least in low tourist season, on a Monday). 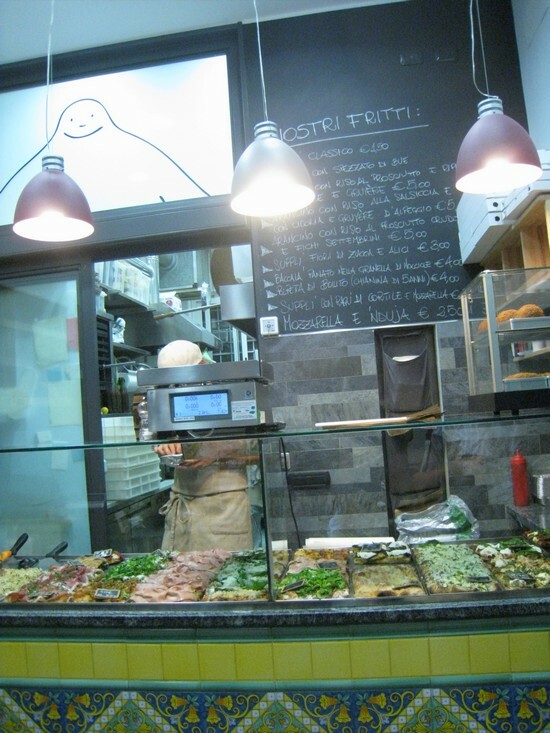 Da Michele is a simple place – the tables are spartan and the menus are taped to the wall. The menu at Da Michele is extremely limited – only 2 pizzas on offer: Margherita and a Marinara. The marinara is simply marinara sauce and garlic. How’s that for simplicity? We ordered a Margherita with doppia (double) mozzarella (5€), which we figured was a good bet as well as a “normal sized” marinara pizza (4€). Each pizza came in either “normal” or “medium” sizes, and the Marinara also came in “maxi.” The doppia mozzarella Margherita did not have a size assigned – but we assume it is a normal size. Even at their smallest, the Da Michele pizzas are large enough to cover an entire dinner plate. Da Michele pizza master at work. So we placed our orders and sat in anticipation for the pizzas. One thing that is constantly impressive is the speed at which the pizzas fly out. Da Michele was a well-oiled machine, with an old gentleman at the pizza dough helm, quietly and meticulously forming and topping the pizzas. You could tell he had been doing this for decades. Our pizzas went into the roaring ovens and a few minutes later they were done. And what pizza! The crust was light and fluffy, but with some bite, and some nice char. Moreover, the crust held up well to all of the toppings. The cheese on the doppia pizza was generously applied and fresh as can be. We also heartily enjoyed the marinara pizza, which seemed to be more than the sum of its parts. The sauce on each pizza was fresh and tomato-y and not overly sweet Warning: there are many cloves of garlic on the Marinara pizza, so this is one for garlic lovers only. It seemed only minutes had passed between when we ordered and when we finished, although we did our best to savor each pizza. Could you eat a better meal for 9€? L enjoyed the doppia mozzarella pizza the best out of all of the pizzas in Naples, especially owing to the heavenly crust quality, and while M enjoyed the pizzas at Da Michele, his heart went with the more exotic toppings at Decumani. We are already nostalgic for all of the great pizza we enjoyed in Naples. For the pizza purist, we highly recommend Da Michele, but if you want a little more topping variety (and less chance of a line) Decumani is a formidable choice. We came to Naples for its pizza, plain and simple. US places claiming authentic Neapolitan pizza are a dime a dozen, so we were extremely excited to try the real deal where it originated. In America, Neapolitan pizza is usually a pretty fancy affair, with each pizza costing upwards of $18. However not so in Naples. Pizza is literally everywhere, and pizza even in the best spots will not run you more than 7€ (less than $10). Naturally, we did our research beforehand so we would only end up at the top locations. Locals who know where to get a good pizza in Napoli. One spot that kept pinging our radar was Decumani. Decumani is located on Via Tribunali, in the heart of historic Napoli. If you find yourself strolling down Tribunali, you really cannot go wrong: there are several famous pizzerias on this road, so after some initial indecision we decided to use our old rule of thumb: go to the crowded place. Arriving at 2 PM, usually a little late for the lunch crowd, the place was still hopping, and after a few minutes of awkward waiting in the corner, we were lucky enough to secure a seat. The menu is surprisingly extensive for a Neapolitan pizzeria: a wide variety of pizzas and fried appetizers, but we were floored by the prices. 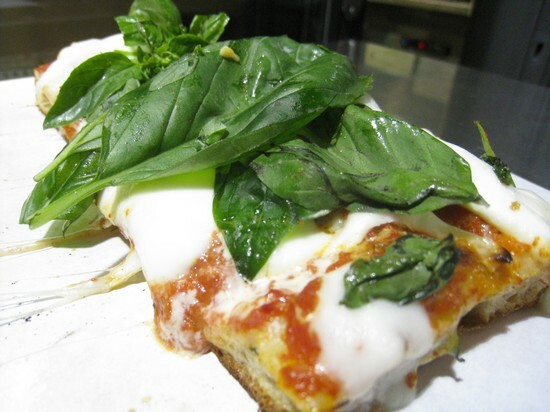 A classic Margherita pizza with basil and fresh mozzarella? 3.50€. Want to splurge and get some more adventurous toppings? It’s impossible to spend more than 7€ on a whole pie, with most pizzas under 5. The prices were so surprising to some, in fact, that one patron actually argued that his bill was – at 70€ for feeding his entire group of 10 people – too low. This is a very good problem to have. Margherita Pizza. The best $5 you will ever spend. Close-up of the spicy cheese tomato-y goodness. Together, L and M sat in I Decumani for about an hour, slowly savoring every bite of our pizzas. M very carefully paid special attention to his salame: cooked to perfection, it was the perfect complement (for him, anyway) to the margherita L was devouring across the table. All in all, for the unbelievable price of 11€, we were totally blown away by our Naples pizza experience. We’ll never be able to have Neapolitan pizza in the US again. But Chicago deep dish, we still love you! 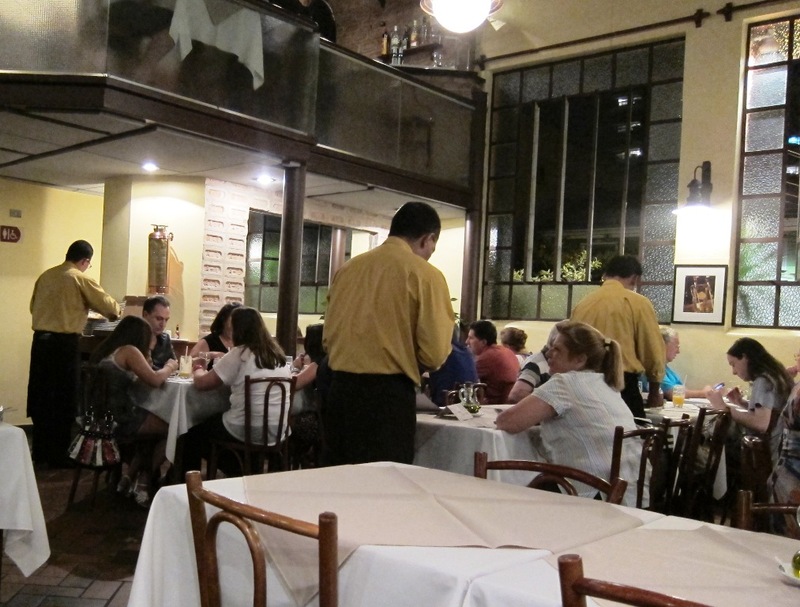 São Paulo is famed for its pizzerias, a fact of which Paulistanos are very proud. The city’s strong pizza heritage is thanks to waves of Italian immigrants that call São Paulo home. There are pizzerias of all stripes in Sampa, from utterly elegant to tiny one-woman operations. We were completely spoiled for choice in São Paulo and didn’t quite know where to start, so we were completely grateful when our hosts in São Paulo, Marciel and Angela, suggested we try 1900 Pizzeria. 1900 Pizzeria, which has several locations around Sampa, is an upscale establishment specializing in artisan Neapolitan pies. The name of 1900 Pizzeria comes from the fact that some iteration of the Pizzeria has been open since the year 1900. The recipe is also reportedly unchanged since that time. The restaurant itself was lively and bustling when we entered at the early, un-Brazilian time of 7 PM, and the partially open kitchen was working full-tilt. We could see pizza ovens burning, which was naturally a good sign. The menu was divided into “Traditional (Tradicionais)” and “Specialty (Especias)” varieties of pizza – with the specialty pizzas having slightly more adventurous combinations like bacalhau and dried beef (and slightly higher price points). Pizzas came in individual, medium and large sizes, and the prices for a large pizza ranged from 47 to 62 reais (about 25-35 dollars). Across 2 large pizzas we sampled 4 varieties (1/2 of a pie each). First up was the endive and Margherita pizza. We had never tried endive on a pizza before, but the slightly spicy endive made for a very delicious and fresh pizza. The classic Margherita was lovely, with a perfect distribution of tomatoes, fresh basil and buffalo mozzarella (see below). Our second pizza (which we tried with a whole wheat crust) was ½ four cheese and ½ arugula. The winner of this pie was the 4 cheese, which included the delicious Brazilian staple Catupiry along with gorgonzola, mozzarella and provolone. We slightly preferred the whole wheat crust, since it added a little more substance to the pizza. For dessert there were also several sweet pizzas, with nutella, strawberries, etc, apparently an exceedingly popular option in São Paulo pizzerias. Though it was more than we are used to paying for pizza, we felt the added cost was worth it. The pizzas at Pizzeria 1900 were excellent, and we are happy that we got to experience a slice of São Paulo pizza culture with our friends. We only wish we could have more time in Sao Paulo to try some more pizza spots. We are happy that there are now more non-rodizio Brazilian restaurants in Chicago. I mean having an endless array of meat skewers is good, but Brazil has so much more to offer! Right off of the Diversey El stop is one such restaurant, Fogo 2 Go. Fogo 2 Go, a tiny restaurant with a giant brick oven, specializes in fresh rotisserie chicken and a wide selection of Brazilian style pizzas (over 60 varieties). The two owners fell in love with the pizza in São Paulo and had originally opened a pizzeria there, later bringing that pizza expertise to Chicago. One obvious thing that sets Brazilian pizza apart from US pizza is an “anything-goes” approach to toppings, and not in a California Pizza Kitchen type of way. We’re talking about toppings of corn, tuna, capers, avocado slices and hardboiled eggs, all together. The pizza menu includes dozens of selections, but any option can be customized. We went with the Frango com Catipury pizza ($17.19 for a medium, $24.69 for an extra large, $11.99 personal size), which came with rotisserie chicken, red sauce, mozzarella and a Brazilian speciality cheese, catipury that is something like Mascarpone. There are also an assortment of classic Brazilian appetizers on the menu like Kibe (yep, Lebanese kibbe), Coixinha (kind of like an excellent chicken nugget) and Pães de queijo ($3.39 for 5 cheese bread rolls – which we ordered of course). We watched as our pizza was assembled by hand in front of us and thrown into the oven along with our pan of pães. About 10 minutes later, both our bread and pizza were ready, the the exceptionally enticing pizza was a mess of bubbly and cheesy goodness. The crust itself was crispy and held up the the mountain of cheese, and the rotisserie chicken was a revelation (new choice for a pizza topping, right?). We also thought that the brick oven firing made the pães especially delicious, but then again we have never met a pão we didn’t like. So kudos to Fogo 2 Go. It is an unassuming but amazing place – but it turns out amazing food. As we left we were urged to come back for the back for the 1/2 chicken special, which was deemed the best in town, by two of Chicago’s finest. Maybe next time, along with our rotisserie chicken and pizza, we can also get a slice of the Prestigio Cake (cocnut and chocolate cake). Sound like a pretty good meal, no? Great Lake has garnered honor after honor for having the top pizza in Chicago, if not the nation. Great Lake features a small, daily changing menu of specialty pizzas with locally-sourced ingredients, which justifies the relatively high price of the 14″ pizzas ($22+). Generally, hype lets us down, but sometimes we have wins (eg Kumas). So how would Great Lake hold up? It is not joke to say that Great Lake is tiny. There are probably only about 8 seats in the place and you cannot sit down until you have ordered and your entire party is there. If you attempt to sit or stand in the restaurant without meeting these requirements you will be summarily kicked out. So long story short, don’t bank on sitting down. A steady takeout traffic also slows things down (a tip: if you’re gonna eat here, do takeout!). When our party of three finally got a table we shared a Cremini Mushroom, White Cheddar, Black Pepper Pizza with herbs ($23). The crust was pretty good, and though it was thin, it held up to the toppings, unfortunately, but was over-charred in places. We also had a prosciutto pizza with buffalo mozzarella ($25). Again, a good pizza with a solid crust, but an inexcusably sparse topping of both mozzarella and prosciutto. Now I know this type of pizza is sparsely topped as a rule, but for 25 bucks I want more than 5 mozzarella rounds…. 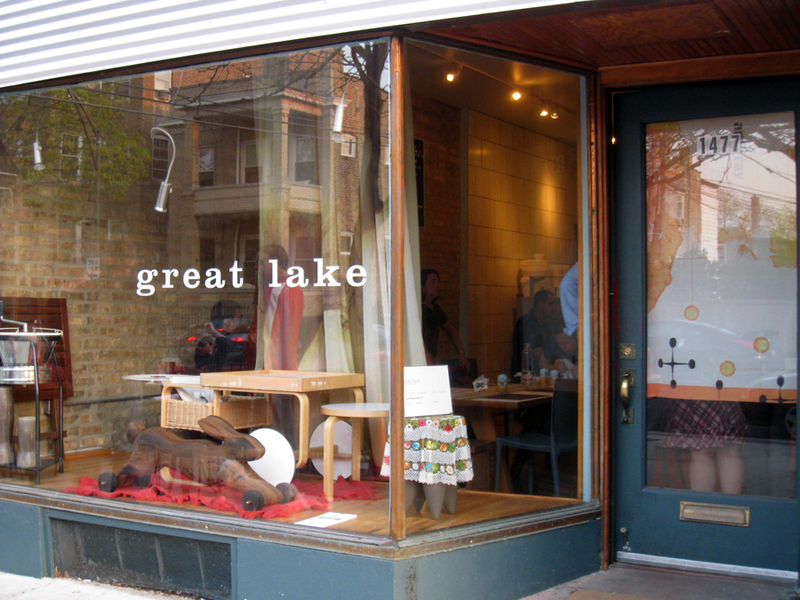 In summary, Great Lake was good, but not THAT good. If I had gone to this place before all the hype I would have liked it more, but not much more. With all of this praise, it was inevitable that the actual product would be something of a letdown. I think the somewhat difficult seating/dining arrangement has also only served to build their paradoxical fame. If you are going to be treated like trash the product must be GREAT, right? All told, I would rather go to a similarly or cheaper priced place with actual tables and service that doesn’t seem to begrudge your mere existence. A bonus: there were also hard-to-find Mast Brothers chocolate bars for sale. We stopped into La Madia (59 W. Grand Ave., Chicago, IL), a casual-chic pizza spot for a quick lunch in the midst of some museum hopping. The restaurant itself is clean and modern with casual striped booths as well as an extensive bar, that seems to be hopping at most any hour. It seems like the perfect place to catch a soccer match or a business lunch. The specialty of the house is wood fired Neapolitan-style pizza, so naturally we thought that would be the perfect lunch. L got the wild mushroom and mozzarella pizza and M ordered lamb sausage pizza ($11). The signature thin crust was crisp, but not hard, and held up well to the toppings. The sausage was delicious – it is cured with fennel and actually made in-house. The mushrooms on L’s pizza were abalone mushrooms and perfectly complemented the delicate mozzarella. Many people seemed to also be enjoying the extensive wine list – each pizza even comes with a suggested wine pairing. The verdict: Good thin-crust pizza in a good location. Talk about old school – this place literally defines old school. From the formica booths to the carpeted walls everything in Vito and Nick’s looks like it (probably) did in the 1960s. The restaurant itself has been turning around awesome thin crust pizzas for almost 90 years. On a trip to Evergreen Park, far away from our neck fo the woods, the eaters decided it would be the perfect occasion to try Vito and Nick’s. This restaurant has something of a legendary status in the ETW household since it has been mentioned many times by our parents over the years, but we never had been there. We arrived at Vito and Nicks at the somewhat odd hour of 2 PM. Even then, it was full of regulars – a group of guys at the bars, and some locals chatting with the waitress. The specialty of Vito and Nicks is undoubtedly the pizza, and what we came for. We split a large thin crust pizza, 1/2 cheese, 1/2 sausage ($14.95). Vito and Nick’s specialty is a delicious cracker-like thin-crust pizza cut into squares, a style native to Chicago, though not a famous as Chicago deep dish. The pizza was delicious – just the right amount of sauce and cheese. The crust, while thin, held up to the toppings. While most of the tables around us were enjoying pizza, the smelt fish fry was a popular choice ($8.95) – with portions so large we could scarcely believe them. The pizza lived up to the hype and we can assure you we will be back. Shag carpet and all, we understand why Vito and Nick’s has stood the test of time. If there’s anything we like as much as world eats, its cheap eats. Even in NYC there are still some deals to be had. Our first day on the road we drove from Chicago to Knoxville. Even with an early start – that’s quite a trip, and we rolled into Knoxville at about 8PM on a Sunday night. Which meant that most places were dead closed! However, we remembered our recommendation to stop at the Pizza Palace, on the east side of Knoxville, so we gave it a try. Driving up to the restaurant feels like a time-warp. When you pull up to Pizza Palace you are immediately greeted by the frozen-in-time 1961 neon sign that has been there ever since the place opened. It was kind of a surreal experience – ordering pizza from a drive-in restaurant on a creaky old phone, as the sun set on an eerily quiet stretch of road. When we arrived at 8, the place was teeming with cars, as you can see above. The restaurant seemed to be doing a brisk business with pizza orders, and it being called ‘pizza palace’ we thought we couldn’t go wrong with some pie. We ordered a medium half-cheese, half-pepperoni pie ($10.85). Despite looking primitive, the old phone system attached to a wooden box worked just fine. Pizza Palace makes Sonic look like something truly out of the space age. But that was all part of the experience. We hear Pizza Palace is also famous for onion rings – 1/2 order is $2.75. For those not in the mood for pizza, the menu boasted other Italian favorites like veal parmesan and spaghetti. To our surprise, we only had to wait about 15 minutes for our piping hot pizza to arrive. An efficient carhop brought out the pie along with a bag of plates, napkins and utensils, which was perfect for us travelers. We weren’t equipped to eat a pizza in the car, so we hoofed it back to our hotel and back to the 21st century. The pizza itself was very good, though not that noteworthy, with a toothsome crust and a slightly sweet tomato sauce. Though we were not blown away by the eats, Pizza Palace was definitely worth it for the retro experience.